Season Ten of Doctor Who, the classic series before the recent resurrection of the series, featured something that must have been a delight to fans of the show: William Hartnell, Patrick Troughton, and Jon Pertwee all appearing together. Well, "together" isn't exactly right. Let me explain. Season Ten, consisting of 26 episodes comprising five serials, began with an attack on time itself. And, the plot line called for the Time Lords not being able to spare resources to help The Doctor. So, they sent The Doctor. And when The Doctor and The Doctor didn't get along, they called on The Doctor to help. I don't think I explained that very well. Except that's exactly what happened. Through some Time Lord mumbo jumbo, they managed to pull the Second Doctor (Patrick Troughton) into the time stream of the Third Doctor (Jon Pertwee), so they could combine forces and battle Omega, who's a Time Lord gone mad. Or rogue. There seems to be a lot of them. Anyway, The Doctor (3.0) and The Doctor (2.0) don't get along, so they bring The Doctor (1.0) to keep them in line. After all, he was the mature one. He wasn't impressed with his third or second incarnations, calling them "a dandy and a clown." Due to William Hartnell's health, he was only able to appear in studio, communicating via video screen with the other Doctors. Regardless, it was great to see William Hartnell in action again. Hartnell's appearances in the serial were his last role of any kind, not just in Doctor Who. The episodes were filmed in late 1972, and aired beginning just before New Year's, and ran into late January 1973. Hartnell's health continued to decline, and he was hospitalized in December 1974, and died in April of 1975. At the end of The Three Doctors (4 episodes), the Time Lords removed the sentence of exile from The Doctor, allowing him to use the TARDIS as before. He made some trips with Jo, but returned to Earth, no longer unable to control the TARDIS. He did experience some issues with landing where he expected, but it wasn't the completely lost in time and space situation from the first six seasons. The Master returned in Frontier in Space (6 episodes). It was Roger Delgado's last appearance on Doctor Who. He died around three months after the episode aired while filming a movie in Turkey. 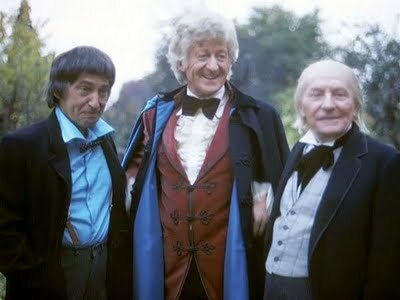 Pertwee and Delgado were close friends, and Delgado's death was one of the reasons that contributed to Pertwee's decision to leave the role of The Doctor after the next season. The Daleks returned at the end of that serial, and followed as the primary antagonist in the next serial, Planet of the Daleks (6 episodes). That serial was could be considered a sequel to Season One's The Daleks, the second Doctor Who serial, and the one that introduced those characters. In Planet of the Daleks, The Doctor encounters Thals, who are still battling the Daleks after all these years. The season ended with the departure of companion Jo Grant (Katy Manning) after she married a hippie environmentalist professor. The serial, The Green Death (6 episodes) was a typical 1970s environmentalist piece. It was typical leftist promotion, with a giant chemical company actively working to poison the planet. 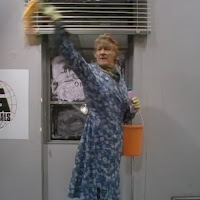 The episode also featured a scene of The Doctor in drag. Those wacky Brits. I've enjoyed Jon Pertwee's time as The Doctor, especially since he's able to cross time and space again. He had one more season in the role before turning it over to Tom Baker. I'm looking forward to seeing Pertwee's last season. Not to say farewell to him, but to see him as The Doctor some more. As long as he's in space and not doing more left-wing hippie stuff. Heh -- "Green Death": Heffenreffer. Have you got to the one where the Doctor concludes " there really is free will"?